Good morning ... I missed this the other day, but the FDA approved contact lenses that get darker under bright light, similar to Transitions lenses for eyeglasses. It's like sunglasses directly on your eyeball. Which will be ... interesting to see in the real world. Outgoing House Speaker Paul Ryan has been by far his party’s No. 1 champion for an aggressive overhaul of entitlement programs. He won’t accomplish that before retiring next year, but his impact on the GOP’s platform isn’t likely to fade in his absence. Ryan forced the issue of entitlement cuts into a position of prominence within the Republican Party, largely through his earlier positions as chairman of the Budget Committee and then as Mitt Romney’s vice presidential candidate. 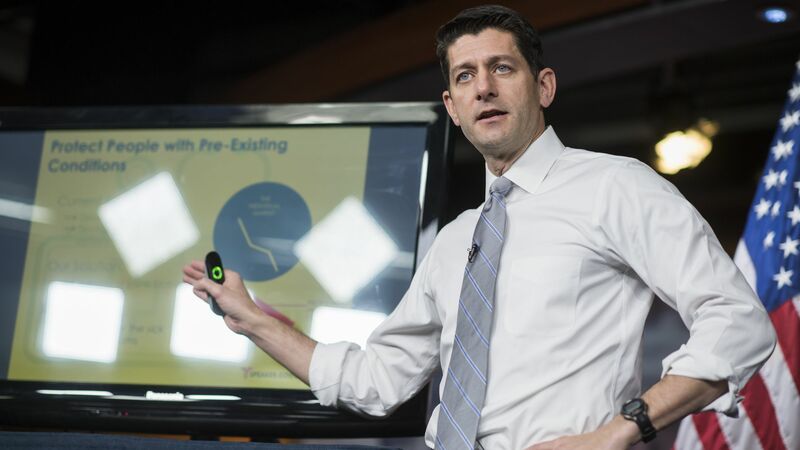 Medicaid: Ryan’s budget proposals called for converting federal Medicaid funding into a block grant to the states. That’s now one of the few pieces of health policy the GOP agrees on. Through all the hue and cry and competing ideas that ultimately sunk last year’s efforts to repeal the Affordable Care Act, steep Medicaid cuts — either through block grants or a system of spending caps — were a constant across almost every bill. Medicare cuts have always been a harder sell politically, and none of Ryan’s potential successors have matched his energy on the issue. “He was a fabulous champion — maybe unequaled,” conservative economist Douglas Holtz-Eakin said. Ryan’s proposals would have converted Medicare from a single-payer program into a new system in which the government gave seniors a subsidy to purchase private coverage, similar to the basic structure of the ACA. That model, known as premium support, will still be a mainstay even without Ryan to press for it, Holtz-Eakin said. The other side: Democrats would love for Holtz-Eakin to be right. Ryan's budgets never became the political poison that liberals (and some Republican strategists) had anticipated in 2012 and 2014, but you could make a strong case that they helped Democrats move back to playing offense on health care. Health care is one of the biggest reasons activism and protests are on the rise — specifically, because ACA supporters have been going to a lot of rallies, the Kaiser Family Foundation’s Drew Altman writes in today’s column. The numbers that matter: A Kaiser Family Foundation-Washington Post survey found that 50 million Americans went to a rally or protest over the last two years, and 14 million — about 28% — said the ACA was one of the main reasons. Of that group, 85% said they were coming out to support the law. The bottom line: That may not be a surprise, since the law was under attack — but the point is that the energy in health care protests has shifted from the right to the left. If you missed this yesterday while holding on for dear life in a tornado of news, you can be forgiven, but a couple of House lawmakers pressed Facebook CEO Mark Zuckerberg about Facebook ads for the illegal sale of opioids. FDA commissioner Scott Gottlieb raised this issue last week, saying social media companies aren't doing enough to police these ads. Reps. David McKinley and Gus Bilirakis picked up on that thread yesterday as they questioned Zuckerberg. "We need to be able to build tools that can proactively go out and identify what might be these ads for opioids, before people even have to flag them for us to review. ... [B]ut today, if someone flags those ads for us, we will take them down." As Congress looks for more ways to address the opioid epidemic, one subset of policy changes is focused on making prescription painkillers harder to abuse — limiting the number of pills in a prescription, for example. But that approach hasn't necessarily worked in the past, and may have had some unintended consequences, according to a new working paper published by the National Bureau of Economic Research. Deaths from abuse of prescription painkillers rose steadily from 2004–2010 — the first phase. The second phase began in August 2010, when the pace of opioid-related deaths started to flatten out and heroin deaths surged. The working paper attributes that to the August 2010 reformulation of OxyContin — a leading prescription painkiller. Those changes made the drug harder to abuse, but "each prevented opioid death was replaced with a heroin death," the paper says. Federal data indicates that we're now in a third phase, in which deaths from illegal synthetic opioids like fentanyl are skyrocketing, and have even outpaced heroin. That trend began in about 2013. Why it matters: As my colleague Caitlin Owens explains in more detail, this is a poignant illustration of why this crisis has been so hard to solve. It also helps explain why public health experts are so adamant that Congress should be pumping more money into treatment. Cracking down on the supply of drugs is important, but when people can easily switch from one drug to another, treating the underlying addiction may have a bigger impact. My colleague Bob Herman is back at it, breaking down the most recently disclosed health care CEO pay packages and how they stack up against their companies' median salaries. If you missed the previous tranches, you can check them here, here, here and here. Get in touch: I always welcome tips, comments and questions. Simply reply to this email, or find me at baker@axios.com.